Premiering in the US on Sy-FY in June, 2013, and broadcast on Sky1 in the UK last year, the epic tale of Sinbad stars newcomer Elliot Knight in the title role and Lost star Naveen Andrews as his nemesis, supported by a high-octane original score composed by Christian Henson. MovieScore Media has previously released his scores for Black Death, Triangle, The Secret of Moonacre, Malice in Wonderland and Storage 24. His music for Sinbad is orchestral in nature with modern film music aesthetics added for a lot of the action material, and exciting ethnic colors added to the traditional sound. The high octane adventure music is balanced by more atmospheric music with a sublime sensual quality. 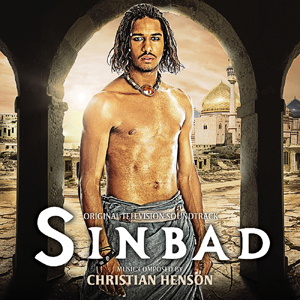 Sinbad was produced by Emmy-winning company Impossible Pictures (Primeval) and is distributed by BBC Worldwide. The 12-part series has been sold to some 20 territories. in the UK, the series aired on Sky 1 last summer and was released on DVD in October, 2012. Our US CD release coincides with the show’s premiere on Sy-Fy. 5/5 Christian Henson is one of those composers who has grabbed my attention over the last several years and though some of the films that go along with the composers work are not always the best. No mistake in the great quality and effort has gone into the score!